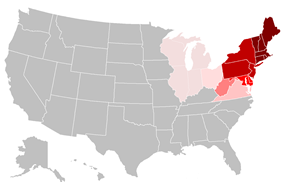 The states shown in the two darkest red shades are included in the United States Census Bureau Northeast Region, with states in lighter shades included in other regional definitions (see Composition). The Northeastern United States, or simply the Northeast, is a geographical region of the United States bounded to the north by Canada, to the east by the Atlantic Ocean, to the south by the Southern United States, and to the west by the Midwestern United States. 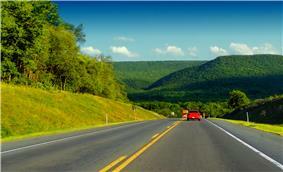 The Northeast is one of the four regions defined by the Census Bureau for the collection and analysis of statistics. The Census Bureau-defined region has a total area of 181,324 sq mi (469,630 km2) with 162,257 sq mi (420,240 km2) of that being land mass. Though lacking a unified cultural identity, the Northeastern region is the nation's most economically developed, densely populated, and culturally diverse. Of the nation’s four census regions, the Northeast is the second most urban, with 85 percent of its population residing within urban areas, led by the West with 90 percent. ^ a b "Census Regions and Divisions of the United States". ^ "American FactFinder". U.S. Census Bureau. 2000. ^ a b c Zelinsky, Wilbur (June 1980). "North America's Vernacular Regions". ^ a b c d Hobbs, Joseph John (2009). World Regional Geography. ^ Elkins, Rick (March 28, 2012). "Census Bureau releases list of urban areas". ^ "2013 Regions of the US Census Bureau". Census Bureau. Retrieved 22 July 2013. ^ Geographic Areas Reference Manual. U.S. Census Bureau. 1994. p. 6-1. Retrieved 2013-07-04. ^ Seymour Sudman and Norman M. Bradburn (1982). Asking Questions: Practical Guide to Questionnaire Design. ^ Dale M. Lewison (1997). Retailing. ^ Pamela Goyan Kittler, Kathryn P. Sucher (2008). Food and Culture. ^ Proceedings of the National Geographic Areas Conference: putting it together for 1990. U.S. Census Bureau. 1984. p. 161. ^ a b "Six: Statistical Groupings of States and Counties". Geographic Areas Reference Manual. U.S. Census Bureau. November 1994. Retrieved July 31, 2013. ^ Verne Thompson, ed. (2010). Encyclopedia of Associations: Regional, State, and Local Organizations: Northeastern States. (Vol. 2: Northeastern States) (22 ed.). ^ The New York Times Guide to Essential Knowledge: A Desk Reference for the Curious Mind. ^ Kelley, Mary Lebreck & Virginia Macken Fitzsimons (2000). Understanding Cultural Diversity: Culture, Curriculum, and Community in Nursing. ^ "Regions of the United States: Regions Defined". ^ "Safety: ORA District and Headquarters Recall Coordinators". U.S. Food and Drug Administration. Retrieved July 24, 2013. ^ "About The Council". Department of Defense Northeast Regional Council. Retrieved September 21, 2013. ^ John C. Hudson (2002). Across This Land: A Regional Geography of the United States and Canada. p. 81 ff. ^ Thomas F. McIlwraith, Edward K. Muller (2001). North America: The Historical Geography of a Changing Continent. p. 190. ^ a b Shelley, Fred M., ed. (1996). Political Geography of the United States. Guilford Press. ^ a b "Region I Jurisdiction". ^ a b Cynthia Nickerson, Robert Ebel, Allison Borchers, and Fernando Carriazo (2007). "Major Uses of Land in the United States". USDA's Economic Research Service. ^ Barron, Eric (2001). "Chapter 4: Potential Consequences of Climate Variability and Change for the Northeastern United States". In National Assessment Synthesis Team, U.S. Global Change Research Program. Climate Change Impacts on the United States: The Potential Consequences of Climate Variability and Change. ^ "Northeast Regional Climate Center". ^ "National Park Service Regions". ^ a b "Northeast Region Locations". ^ Mir Tamim Ansary (2001). Eastern Woodlands Indians. Capstone Classroom. p. 4. ^ Pritzker, Barry (2000). A Native American Encyclopedia: History, Culture, and Peoples. ^ a b "Northeast Region Fact Sheet". ^ "A Brief History of Cambridge, Massachusetts, USA". Cambridge Historical Commission. Retrieved August 16, 2012. ^ Kelly, Martin. "Connecticut Colony". About.com. Retrieved August 16, 2012. ^ a b c d Kelly, Martin. "Rhode Island Colony". About.com. Retrieved August 16, 2012. ^ Newport, Frank. "State of the States: Importance of Religion". Gallup. Retrieved August 17, 2012. ^ "Mississippians Go to Church the Most; Vermonters, Least". Gallup.com. Retrieved 2012-03-17. ^ Jenks, Henry Fitch (1880). The Boston Public Latin School. 1635-1880. M. King. Retrieved August 16, 2012. ^ "Harvard University Founded". CelebrateBoston.com. Retrieved August 16, 2012. ^ Barreveld, Drs. Dirk J. (2001). From New Amsterdam to New York : the founding of New York by the Dutch in July 1625. New York: Writers Club Press. ^ a b c "The Middle Colonies". Radford University. Retrieved August 16, 2012. ^ Forrest, Tuomi J. "William Penn - Introduction". Retrieved August 16, 2012. ^ Munroe, John A (2006). "3. The Lower Counties on The Delaware". History of Delaware (5th, illustrated ed.). University of Delaware Press. p. 45. ^ Lurie, Mappen M (2004), Encyclopedia of New Jersey, Rutgers University Press, p. 327, . ^ Mayo, LS (1921), John Wentworth, Governor of New Hampshire: 1767–1775, Harvard University Press, p. 5 . ^ "Mount Washington". NGS data sheet. ^ a b "Regional Climate Trends and Scenarios for the U.S. National Climate Assessment". ^ "Climate Summaries - Northeast Overview - January 2013". ^ "Climate Summaries - Northeast Overview - July 2012". ^ Frank Hobbs & Nicole Stoops (2002). Demographic Trends in the 20th Century. p. 18. Retrieved July 12, 2013. ^ Jean Gottmann (1961). Megalopolis: The Urbanized Northeastern Seaboard of the United States. New York: Twentieth Century Fund. ^ Raymond E. Murphy (July 1962). "Geographical Review:Megalopolis: The Urbanized Northeastern Seaboard of the United States by Jean Gottmann". ^ "Population and Housing Occupancy Status: 2010 - United States -- Metropolitan Statistical Area; and for Puerto Rico more information 2010 Census National Summary File of Redistricting Data". 2010 United States Census. ^ "American FactFinder". U.S. Census Bureau. Retrieved July 25, 2011. ^ "Gross Domestic Product (GDP) by State". ^ Zelinsky, Wilbur (December 1955). "Some Problems in the Distribution of Generic Terms in the Place-Names of the Northeastern United States". Annals of the Association of American Geographers 45 (4). ^ "Northeast Region - History & Culture". ^ "Religious Identity: States Differ Widely". ^ "All Cities Are Not Created Equal". ^ Kirsch, George B., Othello Harris, Claire Elaine Nolte, ed. (2000). Encyclopedia of Ethnicity and Sports in the United States. Greenwood Publishing Group. ^ Torio CM, Andrews RM (September 2014). "Geographic Variation in Potentially Preventable Hospitalizations for Acute and Chronic Conditions, 2005-2011". HCUP Statistical Brief #178. Rockville, MD: Agency for Healthcare Research and Quality. ^ "State of the States: Political Party Affiliation". ^ Reiter, Howard L. & Jeffrey M. Stonecash (2011). Counter Realignment: Political Change in the Northeastern United States. Cambridge University Press. ^ "Historical Election Results". U.S. National Archives and Records Administration. ^ Hrebenar, Ronald J., Clive S. Thomas, ed. (2010). Interest Group Politics in the Northeastern States. Penn State Press. ^ The U.S. Census Bureau reorganized its administrative units and its regional offices do not cover the Census regions (the northeastern most regional office headquartered in New York City covers New England, New York, New Jersey, and Puerto Rico). ^ Based on U.S. Census Bureau population projections to 2030 (and assuming constant land area) the population density for the South Atlantic division will increase significantly to 294.6/sqmi, New England's density will increase to 249.2/sqmi and the East North Central division will increase only slightly to 200.2/sqmi. The division with the 5th highest density is projected to be the East South Central division at 111.6/sqmi. ^ Where each state, division and region ranks among the 50 states, 9 districts and 4 regions in population density. The Northeastern United States tended to vote Republican in federal elections through the first half of the 20th century, but the region has since the 1990s shifted to become the most Democratic in the nation. Results from a 2008 Gallup poll indicated that eight of the top ten Democratic states were located in the region, with every Northeastern state having a Democratic party affiliation advantage of at least ten points. The following table demonstrates Democratic support in the Northeast as compared to the remainder of the nation. The rate of potentially preventable hospital discharges in the Northeastern United States fell from 2005 to 2011 for overall conditions, acute conditions, and chronic conditions. The Northeast region is home to 22 professional sports franchises in the "Big Four" leagues (NFL, NBA, NHL and MLB), with more than 110 championships collectively among them. The region has also been noted for the relative prevalence of the traditionally Northeastern sports of hockey and lacrosse. According to a 2009 Gallup poll, the Northeastern states differ from most of the rest of the U.S. in religious affiliation, generally reflecting the descendants of immigration patterns of the late 19th and early 20th centuries, with many Catholics arriving from Ireland, Italy, and eastern Europe. Massachusetts, Rhode Island, Connecticut, New York, and New Jersey are the only states in the nation where Catholics outnumber Protestants and other Christian denominations. More than 20% of respondents in Maine, New Hampshire, and Vermont declared no religious identity. 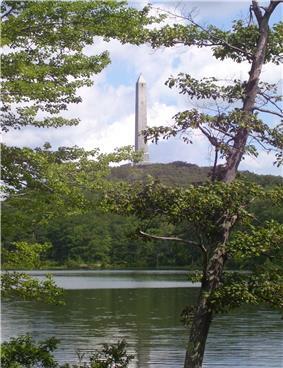 Almost half of the National Historic Landmarks maintained by the National Park Service are located in the Northeastern United States. Geographer Wilbur Zelinsky asserts that the Northeast region lacks a unified cultural identity, but has served as a "culture hearth" for the rest of the nation. Several much smaller geographical regions within the Northeast do have distinct cultural identities. The Federal Bureau of Prisons maintains 17 federal prisons and two affiliated private facilities in the region. 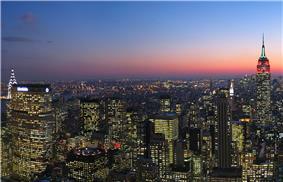 New York City, considered a global financial center, is in the Northeast. The Nuclear Regulatory Commission oversees 34 nuclear reactors, eight for research or testing and 26 for power production in the Northeastern United States. As of 2012, the region accounts for approximately 23% of U.S. gross domestic product. Below are the ten most populous metropolitan statistical areas, and the ten largest cities of the Census Bureau-defined region. Several of these cities in a narrow strip along the seaboard comprise the backbone of the Northeast megalopolis, excluding Baltimore and Washington, D.C.
As of the July, 2013 U.S. Census Bureau estimate, the population of the region totaled 55,943,073. With an average of 345.5 people per square mile, the Northeast is 2.5 times as densely populated as the second-most dense region, the South. Since the last century, the U.S. population has been shifting away from the Northeast (and Midwest) toward the South and West. The Northeast has 72 National Wildlife Refuges, encompassing more than 500,000 acres (780 sq mi; 2,000 km2) of habitat, and designed to protect some of the 92 different threatened and endangered species living in the region. The climate of the Northeastern United States is impacted by the position of the mountain ranges and lakes, as well as the proximity of the Atlantic Ocean. During the winter, a prevailing westerly flow of air masses combines with the polar jet stream to bring bitter cold and frequent storm systems to the region. A semi-permanent high pressure system over the subtropical Atlantic Ocean causes summers to be generally warm and humid. Average annual temperatures range from the 50s and 60s in the far southern and coastal areas to the 20s and 30s in the far northern and mountainous areas. According to the Northeast Regional Climate Center, the average January temperature in its twelve-state region is 23.6 °F (−4.7 °C), with 3.07 inches (78 mm) of precipitation. This compares to July, when the regional average temperature is 69.9 °F (21.1 °C), with 4.25 inches (108 mm) of precipitation. As of 2007, forest-use covered approximately 60% of the Northeastern states (including Delaware, Maryland, and the District of Columbia), about twice the national average. About 12% was cropland and another 4% grassland pasture or range. 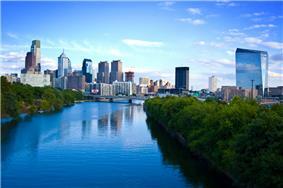 There is also more urbanized land in the Northeast (11%) than any other region in the U.S. While most of the Northeastern United States lie in the Appalachian Highlands physio-graphic region, some are also part of the Atlantic coastal plain which extends south to the southern tip of Florida. 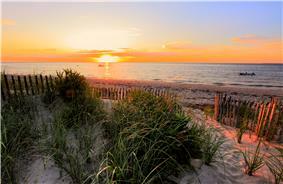 The coastal plain areas (including Cape Cod in Massachusetts, Long Island in New York, most of New Jersey, Delaware, and the Chesapeake Bay region of Maryland) are generally low and flat, with sandy soil and marshy land. The highlands, including the Piedmont and the Appalachian Mountains, are generally heavily forested, ranging from rolling hills to summits greater than 5,000 feet (1,500 m), and pocked with many lakes. The highest peak in the Northeast is Mount Washington (New Hampshire), at 6,288 feet (1,917 m). Penn established representative government and briefly combined his two possessions under one General Assembly in 1682. However, by 1704 the Province of Pennsylvania had grown so large that their representatives wanted to make decisions without the assent of the Lower Counties and the two groups of representatives began meeting on their own, one at Philadelphia, and the other at New Castle. Penn and his heirs remained proprietors of both and always appointed the same person Governor for their Province of Pennsylvania and their territory of the Lower Counties. The fact that Delaware and Pennsylvania shared the same governor was not unique. From 1703 to 1738, New York and New Jersey shared a governor. Massachusetts and New Hampshire also shared a governor for some time. Penn strongly desired access to the sea for his Pennsylvania province and leased what then came to be known as the "Lower Counties on the Delaware" from the Duke. In 1681, William Penn, who wanted to give Quakers a land of religious freedom, founded Pennsylvania and extended freedom of religion to all citizens. Henry Hudson explored the area of present-day New York in 1609 and claimed it for the Netherlands. His journey stimulated Dutch interest, and the area became known as New Netherland. In 1625, the city of New Amsterdam (the location of present-day New York City) was designated the capital of the province. The Dutch New Netherland settlement along the Hudson River and, for a time, the New Sweden settlement along the Delaware River divided the English settlements in the north and the south. In 1664, Charles II of England formally annexed New Netherland and incorporated it into the English colonial empire. The territory became the colonies of New York and New Jersey. New Jersey was originally split into East Jersey and West Jersey until the two were united as a royal colony in 1702. New England played a prominent role in early American education. Starting in the 17th century, the larger towns in New England opened grammar schools, the forerunner of the modern high school. 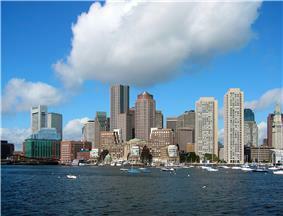 The first public school in the English colonies was the Boston Latin School, founded in 1635. In 1636, the colonial legislature of Massachusetts founded Harvard College, the oldest institution of higher learning in the United States. Although the first settlers of New England were motivated by religion, in more recent history, New England has become one of the least religious parts of the United States. In a 2009 Gallup survey, less than half of residents in Vermont, New Hampshire, Maine, and Massachusetts reported religion as an important part of their daily life. In a 2010 Gallup survey, less than 30% of residents in Vermont, New Hampshire, Maine, and Massachusetts reported attending church weekly, giving them the lowest church attendance among U.S. states. The first Europeans to settle New England were Pilgrims from England, who landed in present-day Massachusetts in 1620. The Pilgrims arrived by the Mayflower and founded Plymouth Colony so they could practice religion freely. Ten years later, a larger group of Puritans settled north of Plymouth Colony in Boston to form Massachusetts Bay Colony. In 1636, colonists established Connecticut Colony and Providence Plantations. Providence was founded by Roger Williams, who was banished by Massachusetts for his beliefs in freedom of religion, and it was the first colony to guarantee all citizens freedom of worship. Anne Hutchinson, who was also banished by Massachusetts, formed the town of Portsmouth. Providence, Portsmouth, and two other towns (Newport and Warwick) consolidated to form the Colony of Rhode Island and Providence Plantations. All of the states making up the Northeastern region were among the original Thirteen Colonies, though Maine and Vermont were part of other colonies before the United States became independent in the American Revolution. The two cultural and geographic regions that form parts of the Northeastern region have distinct histories. Anthropologists recognize the "Northeastern Woodlands" as one of the cultural regions that existed in the Western Hemisphere at the time of European colonists in the 15th and later centuries. Most did not settle in North America until the 17th century. The cultural area, known as the "Northeastern Woodlands," in addition to covering the entire Northeast U.S., also covered much of what is now Canada and others regions of what is now the eastern United States. Among the many tribes that inhabited this area were those that made up the Iroquois nations and the numerous Algonquian peoples. 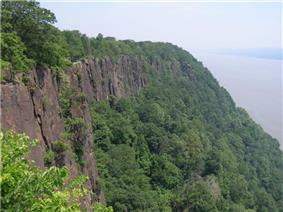 In the United States of the 21st century, 18 federally recognized tribes reside in the Northeast. Delaware, Maryland, and Washington, D.C. The Library of Congress defines the Northeastern states as those east of Mississippi River and north of the Ohio and Potomac Rivers.